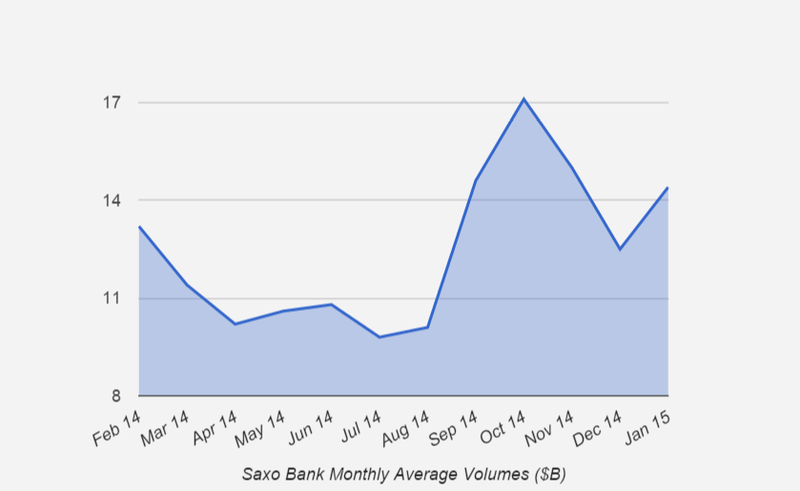 Saxo Bank has reported its trading and account metrics for the month of January. During the month, average daily volumes (ADV) rose 12.5% from December to $14.4 billion. Overall for the month, $302 billion was traded, the highest figure since October’s $392 billion 2014-high results. The increase in volumes follows similar results around the industry in which brokers have reported a strong start to activity for the year despite volatility in the Swiss franc affecting numerous traders. Despite the increase in volumes, Saxo Bank did report a decrease in client collateral available for trading to $10.47 billion from $11.1 billion in December. The decrease occurs as the broker absorbed over $100 million in client negative balances from Swiss franc volatility in January’s “Black Thursday” event. During 2014, client deposit levels experienced steady growth at Saxo Bank, having peaked at the end of November at $11.37 billion after ending 2013 at just above $8 billion. Following Black Thursday, Saxo Bank had reported that it was the beneficiary of clients rotating funds to the firm as they left weaker capitalized companies. However, since that time the firm has revealed that it did experience client losses which they are working on collecting. In addition, the broker increased margin requirements which, for at least the short term, shows they will be focusing on larger, more risk-averse customers as opposed to high-leverage trading speculators. As such, the decline in deposits, despite initially reporting an increase in new accounts, could be the result of more active customers and clients calling it quits after suffering franc related losses and leaving the broker. Looking ahead, with the overhang from Black Thursday as well as higher margins, it will be worth watching how Saxo Bank client deposit levels track during 2015. In addition, it will interesting to view how volumes are impacted with the decrease in available leverage. If activity remains solid, it could lead other brokers to decide to also slash their leverage rates as they may also believe that they can keep volumes steady while simultaneously reducing client risk. Any broker wishing to harm loyal customers when things go wrong should lose All clients. Saxo situation is similar to if you buy car insurance for £200 and when your invoice comes through its £2000. Warning clients is a good thing…. But knowing full well their total exposure they could have employed better risk management to handle at least some of the carnage on 15th Jan.
Just because there is something to protect them on their T&C doesn’t make it right. Have any clients got fill improvements in their favour on events like this from Saxo….. I’m guessing no. It’s an asymmetric business where the clients come at the lower end.